Don't know if the new baby will be a boy or girl? Tired of the traditional pink or blue baby blanket? 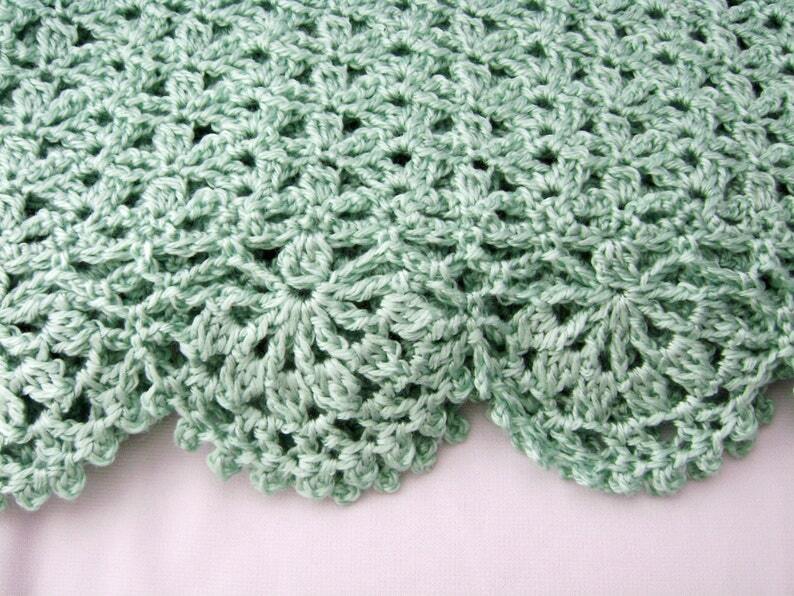 This mint green hand-crocheted baby blanket is just what you need! I used a dk weight acrylic baby yarn to crochet this afghan, making it is easy to care for and appropriate for any time of year or climate. The stitch is light and airy, with a deeply scalloped border. This handcrafted afghan is ready to ship to you today! Perfect for a baby shower, to celebrate baby's birth, or for a baptism or Christening gift. Measurement: 40 inches (102 cm) long by 31 inches (79 cm)wide. All my items are made by my own hands in my smoke free, dog friendly home. Shipping: The afghan will be shipped via USPS Priority Mail with delivery confirmation to customers within the US. International customers, including Canada, will receive their afghan via USPS International First Class Mail. Any duties or customs fees are the responsibility of the purchaser. If you would like a different color, a custom order can be placed. Please allow 4 to 6 weeks on custom orders.